So we’ve been canoeing around town the last couple of days here in Gainesville. The rain has been coming in fits and starts of torrential downpour and we’ve been under a Flash Flood Warning since yesterday. The worst part was when I was trying to run errands yesterday and got a flat tire. The rain fortunately stopped while the nice AAA tech was putting on the donut, but it started up again almost immediately afterward and I had to wait for almost two hours at the tire place to get the patch put on. We are expecting more rain for the rest of the week, and there is a tropical depression in the Caribbean right now that will probably bring more rain by week’s end. The best part is that it’s been under 80 degrees all day and it’s been GLORIOUS. The air smells like fall and I’m really enjoying the cooler weather. Normally it would be about 115 and drier than a desert this time of year so I will appreciate the cool and damp while I’ve got it. Meanwhile, I did a search for The Bookaneer on Google just to see what I’d find. I knew that I wasn’t the only Bookaneer out there, as there is at least one store and another blog by the same name. 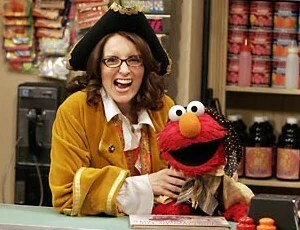 Much to my surprise, there is also a sketch from a Sesame Street episode, where a Bookaneer Captain (played by Tina Fey) leads some Muppets (including a salty dog, haha), along with Elmo, on a search for the treasure found in books amid the shelves of the Sesame Street Library! A pirate after my own heart! I’m so glad to know that I’m on the same page as Sesame Street which is a show that was incredibly influential in my wee pirate days (along with Reading Rainbow and Mister Rogers’ Neighborhood). Keep pirating along, Bookaneers! Books hold the greatest treasures of all! Love Tina Fey, but you’re by far my favorite Bookaneer, chica.